Task, Project Task and Issues lists have a “Send e-mail when ownership is assigned” feature. When you use Item-level Permissions and set Read Access to Only their own these emails no longer work. It appears that when you go back to Settings > Advanced Settings the Send Email when Ownership is assigned radio is set back to No when using Read Access = Only their own. Speculating here – I think that its because its very possible to set this up so the owner is not the assigned to person so you shouldn’t send an email to someone who shouldn’t be able to read it (and remember that when you re-assign a task an email goes out to both the old assignee and the new assignee) so rather than deal with these tricky scenario they just decided to disable it altogether. When you try to use the Approval workflow in SharePoint Server 2007, e-mail message are sent in plain text format instead of in HTML format. This part of the Troubleshooting SharePoint Email Alerts guide covers how to verify that the SharePoint Timer jobs that send these alerts are running correctly. If you are getting the Initial confirmation emails but not the Alerts emails then this may be the culprit. Its probably the least understood part of the troubleshooting process; reading through the newsgroups/blogosphere you will notice lots of posts explaining how something seemingly random like disabling and enabling alerts fixed someone’s problem, who said Reboot? 😉 – but not another. But hey, whilst its nice to understand why something worked – sometimes we just need to get it working! If its not running try and start it. Check the Windows Event logs for problems – any problems are almost certainly to do with the account its running under and permissions given. Note – To add to STSADM’s to paths use SET PATH=%PATH%;"c:Program FilesCommon FilesMicrosoft Sharedweb server extensions12BIN"
Some users have reported that even though these properties are listed correctly above, simply resetting them solved the problem. Be aware, some but not all have reported that this can remove existing alerts. stsadm –o setproperty -url http://YourSiteURL –pn job-immediate-alerts –pv “Every 5 minutes between 0 and 59"
Again, some people have reported that this works with no agreement on the cause. -f "c:Program FilesCommon FilesMicrosoft Sharedweb server extensions12TEMPLATEXMLalerttemplates.xml"
See Steve Chen and harikumh’s posts where they talk about checking through ULS jobs and the database tables that underpin SharePoint Alerts. Of course if you get to this stage you may want to consider placing a call to Microsoft Product Support. KB942989 If you back up a SharePoint web application and then restore it t a new farm, some SharePoint timer jobs are not restored successfully – now fixed in Post Service pack 1 hotfix 941422 Jan 31st 2008 and subsequent cumulative updates. Consider the following scenario. You perform a database migration to upgrade Microsoft Windows SharePoint Services 2.0 to Microsoft Windows SharePoint Services 3.0. To do this, you deploy Windows SharePoint Services 3.0. Then, you add the content databases to the Web applications in the new Windows SharePoint Services 3.0 environment. Users do not receive e-mail notifications for existing alerts for a list or for a document library that was migrated from Windows SharePoint Services 2.0. Users do not receive e-mail notifications for new alerts that they create for a list or for a document library that was migrated from Windows SharePoint Services 2.0. To receive e-mail notifications, the user must first delete the existing alert. Then, the user must create a new alert. This issue occurs if the URL of the Windows SharePoint Services 2.0 server differs from the URL of the Windows SharePoint 3.0 server. For example, this issue occurs if the URL of the Windows SharePoint Services 3.0 server is http://ServerNameVersion3, and the URL of the Windows SharePoint Services 2.0 server is http://ServerNameVersion2. The ImmedSubscription table in the content database has a Siteurl column. If the value in the Siteurl column does not match the URL of the Web application, Windows SharePoint Services does not send e-mail notifications when content in a list or in a document library changes. This part of the Troubleshooting SharePoint Email Alerts guide covers situations where you are getting emails for some users but not for others. Its intermittent i.e. users will sometimes get email alerts but sometimes not, for the same list/list item. Then the culprit is probably the email infrastructure. As always the wild card is spam filtering and email rules – so thoroughly discount these first! Check the People and Groups list for a correct email address. Check the site collections people and groups list for a correct email address. Don’t assume this is correct and skip this step, yes I know its correct in AD but seriously, don’t skip this! Also be aware that site collections (even in the same web application) are independent and have there own user lists – you may have to check each one. Site Actions > Site Settings > People and Groups > All People. Find the users and check the email address is correct. The initial email alert confirmation is sent out regardless of the permissions on the list. Subesquent alert emails are ‘security trimmed’ i.e. they are only sent out if the users has at least read permissions on the list an the list item that would have triggered the email. Does the site inherit permissions from the site collection? Does this list inherit permissions from its parent web site? Under Item-level permissions are users only allowed to Read their own items? Does this list item inherit permissions from its parent list? If not then does the user have permission on this list item? 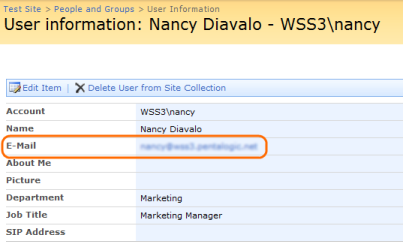 To verify; check the user in question can open both the list and the item in question from SharePoint. "Alertsjob results for *** delivery: 10 prematches, 10 passed filtering, 8 of 10 passed security trimming..."
This part of the alert troubleshooting guide will talk you through the steps necessary to verify that emails can be successfully routed from your SharePoint server to the users mailbox. Even if you get one of those you may still need to verify how your email setup is configured. You may also want to read this short SMTP primer if you are new to SMTP and related email technologies. First check the email settings in SharePoint central administration are correct (SharePoint Central Administration > Operations > Outgoing Emails Settings) – note the Outbound SMTP server, From and Reply To addresses. Use these settings to send some test emails using a tool like the SMTP Test Tool or Telnet on your SharePoint servers to send some test emails. If you don’t receive the emails you expect verify. Does the SMTP server permit connections (relay’s) from your SharePoint servers? Is the destination SMTP server configured to deliver emails or relay them to another SMTP server and if so is it working? Remember that if your security blocks SMTP transmissions based on process or account then test tools such as Telnet or SMTP Test tool will be a different process and will often be running under a different account to SharePoint and the timer service. Does your SMTP server require a username/password or SSL? In which case you will have to install something like Windows IIS SMTP server (locally on or another server), set SharePoint to deliver emails to this and then deliver emails directly or relay those emails onto your main SMTP server. This guide shows how you would set IIS SMTP server to relay messages from SharePoint to smtp.google.com as an example. Is this user’s email is being delivered successfully from other sources, what about external email addresses such as hotmail / gmail? This can help narrow down the problem between problems on the sending side an receiving side. Do emails to users on the internal domain get delivered and external email addresses fail (or vice versa) – in which case you need to look in detail at your email infrastructure to determine where the problem lies. If internal emails are getting through but external ones are not then use the SMTPDiag utility to verify DNS configuration on your SMTP server are not stopping external delivery. As always the wildcards are SPAM filters and email auto processing rules – always suspect these first! To make best use of the guide to troubleshooting why SharePoint Alert emails stop working its helpful to have an little understanding of what is going on under the covers. When you first setup an alert a confirmation email is sent to the recipient of the alerts. This email is sent immediately from the Web Front End (WFE) serving the page at that time and running under the Identity that the IIS worker process (w3wp.exe) is using. By default this runs every 5 minutes – this means that even when you set “Send e-mail immediately” its not really immediately, there could be a short wait for your emails to be sent. What does mean for Troubleshooting? These two types of email are being sent at different times from different components of SharePoint and often using different Identities running on different servers. There may be a problem stopping the SharePoint timer job running that doesn’t effect the confirmation emails. You get the idea! For troubeshooting purposes you should treat them quite separately. If the main guide for Troubleshooting Alert Emails in SharePoint (WSS/MOSS) doesn’t help you solve the problem then you may find the answer in one of these posts – come back and post a comment and I’ll update the guide for others. had built this farm a little over a year ago and all of the sudden, alerts stopped working…. This is happening to everyone… both new and old alerts. You have a mailbox on a server that is running Microsoft Exchange Server 2003. 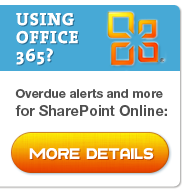 You use Microsoft Office SharePoint Server 2007 to send a notification message to the mailbox. You try to open the SharePoint Server 2007 notification message in Microsoft Office Outlook 2007. Outlook 2007 is running in Cached Exchange Mode. The BDC Alert Manager from Lightning Tools allows your users to stay informed by email as their critical business data changes. Alerts can easily be configured and managed for any Business Data Catalog Data source from a central place.